It was another ho-hum day for the Chicago Blackhawks at the Sochi Olympics, as several players saw their national teams suffer crippling defeats. For Slovakia, Marian Hossa and Michal Handzus combined for six shots on goal and a minus-2 rating as their team fell to Slovenia by a score of 3-1. The loss puts Slovakia at 0-2, and going into a tough matchup against Russia on Sunday, the Slovaks are in danger of drawing a really low seed and being a casualty when the playoffs begin for quarterfinal spots on Tuesday. As for the Czech Republic bunch, Michal Rozsival was held off the scoresheet once again as they lost a tough 1-0 decision to Switzerland. The Swiss have only allowed one goal in three games in the tournament, and their six points in the standings put them second behind Sweden in their pool. Speaking of the Swedes, it was another remarkably uneventful day for the three Blackhawks on the team. Marcus Kruger had a shot on goal in the game, but also committed a silly interference penalty in the defensive zone. Niklas Hjalmarsson and Johnny Oduya were both held without a shot on goal as their defensive pairing continued to be used mostly for penalty killing and defensive assignments at even strength, but they weren’t even all that great in those areas as the Swedes surrendered two power play goals to a Latvia team that isn’t exactly loaded with talent. 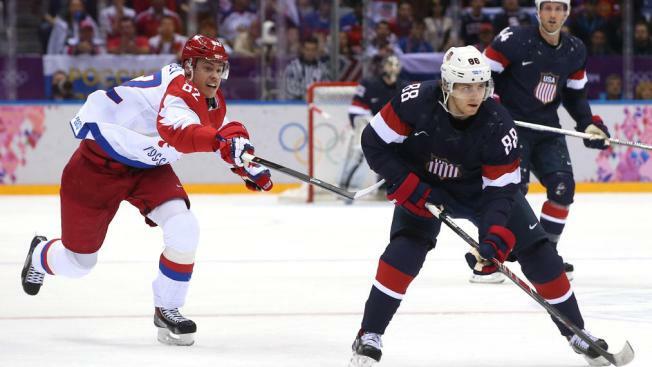 Finally though, it was Team USA and Patrick Kane that provided the most emphatic statement for the Hawks so far in these Olympics. In the 3-2 victory over Russia, Kane had five shots on goal and picked up one of the most spectacular assists of the tournament, as he wired a cross-ice pass perfectly onto the stick of Joe Pavelski, who potted the one-timer goal and gave the U.S. a 2-1 lead. Kane also had several opportunities in overtime to end the game for the Americans, but he was unable to solve goaltender Sergei Bobrovsky. The first game on a breakaway at about the halfway mark of the extra frame, but Kane’s quick wrist shot ended up drawing leg pads and skittered harmlessly away. Kane got another crack at a goal right on the doorstep with about 30 seconds remaining in the overtime, but once again Bobrovsky was in good position and was able to smother the puck.